If you're planning on dressing up for an 80s party or festival then a wig is essential for creating a fun look. 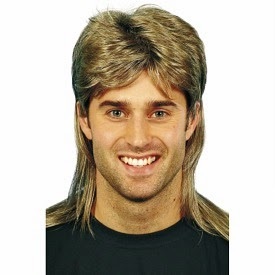 If you want to get people around you laughing then a mullet wig is almost guaranteed to do the job! The most popular 80s wig that is sold through my website (simplyeighties.com) is the first one featured here. I've labelled it as a Jason Donovan wig because it reminds me very much of the hair style that he adopted when he played Scott Robinson in the Aussie soap Neighbours - how I miss coming home from from a hard day at work and putting my feet up on the sofa to watch the latest episode. This isn't the cheapest wig option, but it's certainly one of the better quality ones and has, so far, been highly rated by customers. 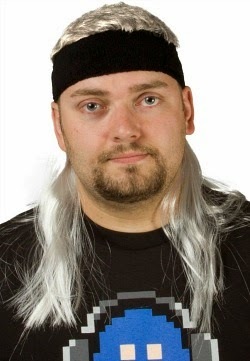 Amazon has a particularly good range of mullet wigs, so it's well worth giving them a visit. Another site where leading suppliers are selling wigs at very competitive prices is ebay. These are brand new, "buy it now" items, and you'll find it hard to beat the prices on here. This is the best rated wig by customers and is receiving very positive feedback and ratings. The quality defies the low price. 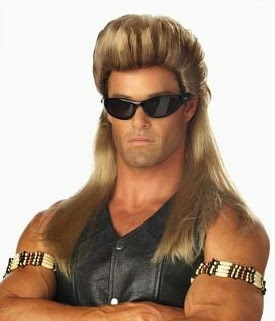 It's not a true mullet, but the wig is perfect for creating an 80s look. 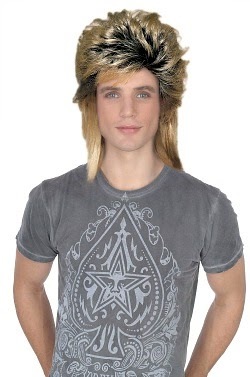 This spiky mullet wig very much resembles the look of 80s pop stars such as Limahl from Kajagoogoo. It could also be used for punk dress-up. Again, the price is very reasonable. This sporty mullet by Mullet On The Go (with headband) is sold by a number of suppliers at Amazon and is available in three styles. It's good value at under £10 and ideal for creating a fun workout look. 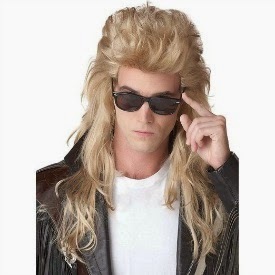 This very blonde mullet wig was less than £8 as I write (this is subject to change, of course) and is produced by Wicked Costumes is great value with very positive customer reviews. Some of the most amazing costumes are produced by California Costumes and, thankfully, they also supply some fantastic-looking mullet wigs, too. You're not going to get a lot of change out of £20, but if you really want to look the part then one of their fine-looking mullets will get you noticed. If you want to look like an 80s rock star then this wig is for you. It looks very much like the hair style that Daryl Hall (from Hall and Oates) wore. 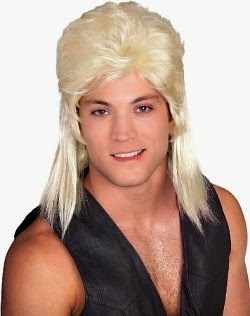 It's the ultimate mullet style and perfect for wearing with a leather motorcycle jacket. Leather fringe jackets (with tassels) were all the rage back in the day, but they're very hard to find these days. You could create a fun biker/rock look using this fantastic T-shirt which looks like a leather biker vest over a T-shirt. This is an excellent idea and a great way to create a rock style without spending a fortune on a real leather vest or jacket. Finally, the wig has a new romantic feel and is getting plenty of good feedback. For more 80s costume ideas for men take a gander at my website.